Although a customized Seven Seas pool is the main attraction at any party, your pool is just the beginning of a well-planned backyard party. If you want the title of “Ultimate Party Host,” you’re going to have to consider a few more things before you start sending the invites. But don’t worry, we’ve got you covered with these 5 steps to a perfectly planned pool party. Every party begins with a theme. Are you planning for a child’s birthday? Try a sports theme, or even this Beachy Mermaid themed party or Shark Party. If you’re planning an adults only party, go for a more elegant theme like this Make A Splash party or this fun Salty Watermelon Cocktail Pool Party. Once you’ve chosen a theme, you’re ready for one of the most fun steps of party planning… decorating! Now that you’ve chosen a theme you can decorate as simply or as over the top as you’d like – just make sure you stick to the theme! The following are a few areas to consider while decorating for your party. The table isn’t just an area to eat, its a fun way to impress your guests with custom details. Decorate according to a color scheme, like this Blue And Pink table setting. Give your guests an after dinner mint while sticking to your pool theme with these Life Saver Candy Place Settings, or leave one of these Beach Themed Message In A Bottle party favors at each guest’s seat. Whether they’re bright and playful or soft and romantic, lights will illuminate your party’s theme. 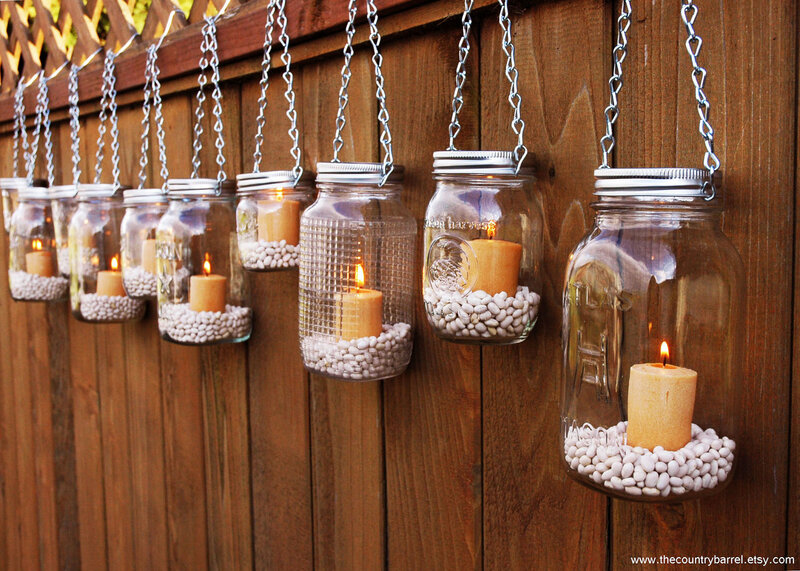 For an elegant vintage look place tea candles in mason jars like these Mason Jar Luminaries. Pool noodles may not be the first thing you think of when trying to set the mood but with these Pool Noodle Luminaries, your guests will be awed by the elegance that these pool toys create. Your Seven Seas pool is the star of your party. Don’t forget to use your pool as the centerpiece that it is. Attach fresh carnations to styrofoam balls to create colorful floating floral arrangements like these Floating Flowers, or illuminate your pool’s glow with these Pool Lanterns. Make sure your guests’ stomachs are full with these Teddy At The Beach Cupcakes or go for a healthier option like a cute theme-matching veggie platter, or make healthy more fun with these Fruit Filled Ice Cream Cones. Guests will be talking about your party for the rest of the year if you keep them entertained, especially with these 10 Fun DIY Backyard Entertainment Ideas, or bring Hollywood to your backyard oasis with this guide on What You Need To Host A Backyard Movie Theatre Party. If you’re looking for even more creative pool party ideas check out our Backyard Party Ideas Board on Pinterest to help you plan for all of your parties. Our board even includes ideas on how to show off your hot tub while throwing a backyard party in the fall! Follow Seven Seas Pools & Spas’s board Backyard Party Ideas on Pinterest. Have you thrown a pool party this summer? Share your pictures with us on Facebook and you could be featured on our page.